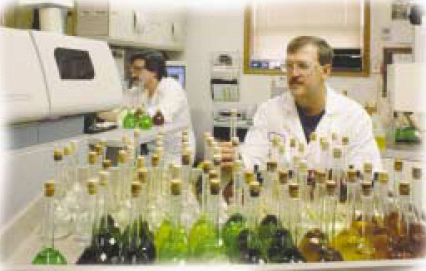 Our analytical laboratory uses classic volumetric, gravimetric, and fire assay techniques, advanced X-ray fluorescence, atomic absorption (AA), and inductively coupled plasma (ICP), emission spectroscopy. Instrumentation and processing techniques provide the most accurate methods for determining precious metals content for recovery to assure highest possible return. Our state of the art processing facilities include rotary, crucible, and electric arc furnaces, kilns, roasters, thermal processors, pulverizers, granulators, screens, blenders, autosamplers, reactors, dissolvers, precipitators, electrolytic cells, and filter presses. Our advanced sampling procedures help provide accurate determination of the precise amount of precious metals present in materials for recovery. Three different sampling techniques are used depending upon materials and precious metals content – dry sampling, melt sampling, and solution sampling. Melt sampling - This technique is generally used with materials such as jewelry, optical scrap, and many high grade electronic materials that contain significant precious metals. Solution sampling - Solution sampling is used for precious metal bearing solutions because of its cost-effectiveness and extremely accurate ability to determine precious metals content. Dry sampling - Dry sampling is used when materials cannot be dissolved in a solution or are inappropriate to melt either because of their structure, or because of the cost associated with melting vs. the possible return.